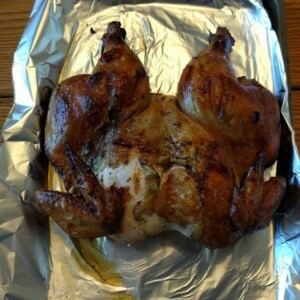 I recently came across a recipe for cooking whole chickens that sounded both interesting and simple. Lucky for me, I have a couple of hours after work each day to prepare a meal. I generally don't prefer spending the whole two hours in the kitchen, instead my go-to weekday kitchen recipe involves the crockpot or dutch oven. This recipe is a similar to both: prepare the day before, and spend and hour or so day of monitoring the cooking. In reviewing the recipe, I already have all the ingredients around the house or in the garden. The most difficult and messy part of preparing for the Spatchcock recipe is cutting the chicken open, which I've thankfully done before. And since it's summer, I decided to plan to test drive this recipe. Avoid splattering chicken all over the kitchen. I smashed my chicken on a chopping board in the sink to minimize the risk on contamination. The flatter the chicken, the better, so get ready to flatten the bottom of a pot. Be sure to monitor the chicken when it's grilling. I took my laptop outside and enjoyed the afternoon. Even though it only got 2 hours to marinate (I forgot to prepare it the night before), the chicken was a hit. The chicken came out fragrant, juicy, and very tender. The bottom (inside of the chicken) was noticeably charred, but the rest of the chicken was perfectly cooked through. The cooking process was simple and required minimal oversight, which is exactly the recipe I'm looking for after a long workday. I didn't have to keep an eye on it, but I did stay nearby to keep an eye on the flame to prevent oil fire. If you notice the flames flaring up, put the fire out and turn the temperature down! Follow that and you're sure to get a delicious resulting chicken. With a pair of kitchen scissors, cut the chicken open by cutting along both sides of the spine. Mix the rest of the ingredients (olive oil, minced garlic, paprika, lemon juice and zest, thymes, oregano, black pepper, salt, and bay leaves). In a large sealed bag, combine the marinade and the flattened bird. Let the flavors soak into the chicken overnight. When fully marinaded, take out the chicken and let it reach room temperature. Preheat the grill to a medium temperature. When the grill is ready, place your flattened chicken's open cavity facing the grill (skin should be facing up). Grill it until the thickest part of the thigh hits 160 degrees. It should take about 50 minutes. Periodically check the grill for any flareups. Flip the chicken over on the skin to let the skin crisp and char. Cook until the thigh hits 165 degrees. Remove the chicken from heat and let it sit 15-20 minutes before carving.